Tithe.ly ChMS is most useful to volunteer teams when it’s set up well. This part will step you through how to best set up Tithe.ly ChMS for your church. ‘Departments’ define how your volunteers are grouped. 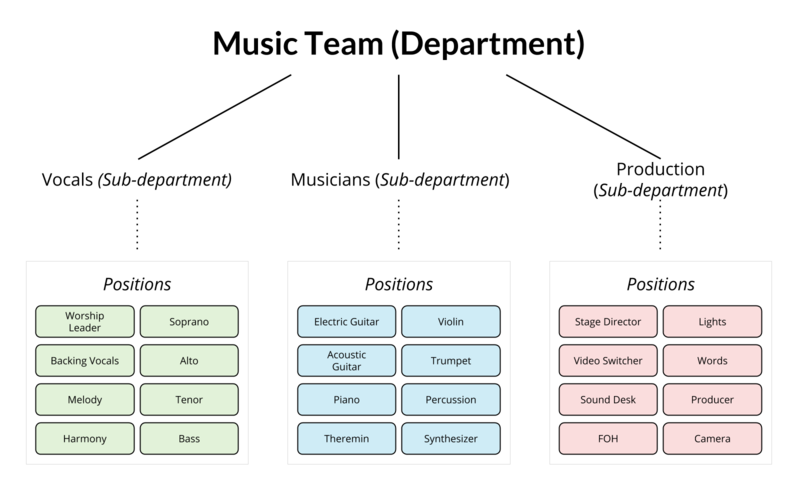 In your music team, for example, you might have smaller groups that work together – like the band, the singers, the tech team, and the backstage crew. Each of these smaller groups should be a sub-department. Volunteers are the positions inside your sub-departments. Your band might include keyboard, guitar, bass, drums, and strings. ‘Service Types’ function as a template for the different services held within your church. Your Sunday-morning service, for example, is probably at the same time every week. Its structure and volunteer list is probably similar too. Setting up a service type will save you time every week by pre-filling some of those details. We recommend setting up a service type for any regular event your church runs. For example, if your Youth Group meets every Friday night, set up a service type with a typical run sheet and the necessary volunteer positions.